I'm already feeling the stress of the holiday season. With a jam packed work schedule, I realized today that I have only six days (3 weekends) to get my holiday spirit together - shopping, baking and decorating (oh, and of course some- many, cocktail parties)! In stressful times like these, I need a big dose of interior design therapy with my favorite bon vivant designer, Ken Fulk. It's no secret that I have a serious design crush on Fulk - He's a style maestro of bespoke and high gloss glamour with a trademark flair for taxidermy. 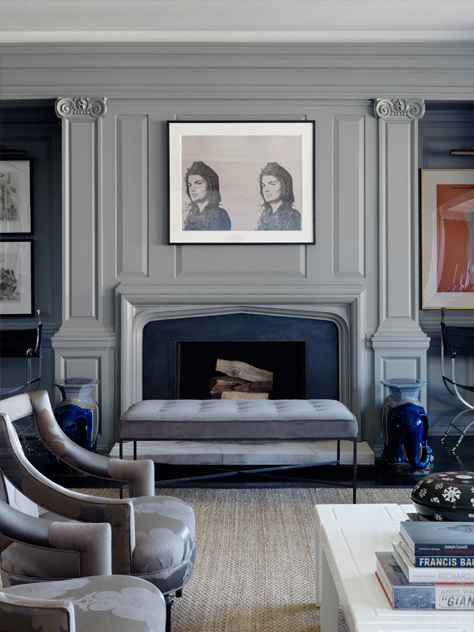 Here's to feeling Merry with interior therapy featuring some of my favorite Ken Fulk interiors. I love the juxtaposition of the worn antique trunk against the mid-century modern chairs, but the gilded religious bookshelf is the ultimate statement piece. Who knew mint green could be an AMAZING interior color! This bold wallpaper would transform any space into pure chic. Forget the walls and focus on the ceiling. Crushed green velvet normally wouldn't sound so nice but, in Fulk's hands, gorgeous! No space is too small for large scale drama. Ceiling to floor gallery wall and muted organic tones. I never tire of artwork above a bath tub. A vintage retail display houses Fulk's shoes at his home in San Francisco. Vintage collars are artfully displayed next to stacks of vintage luggage. Morocco meets minimalism in this serene living room. I love the unexpected cow hide on the head chair. Layers of patterns are surprisingly in harmony with the bold blue lacquered walls. Bespoke luxury - stacked trunks and stacked books. The sink makes this basic farmhouse kitchen swoon-worthy. After seeing this, I'm convinced that every bathroom should have a chair in it! The Battery in San Francisco. I love the contrast of the eye popping tapestry against the moody brick walls. Monogrammed garment bags keep orderly fashion of Fulk's clothing. The fireplace is pure genius. I usually don't like themed rooms, but there's something I can't resist about this room. This glamorous space would surely lift your spirits during the holidays. Black and white still reign as king of simple-chic luxury.